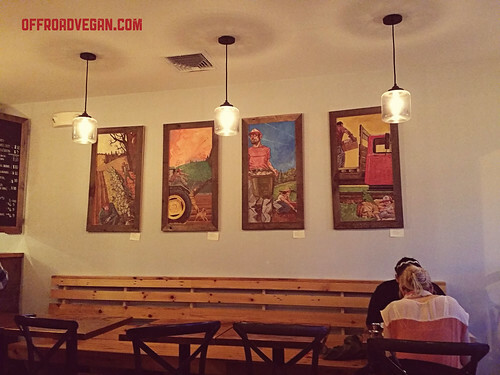 There is a little village outside Boston (right off the Pike) that should be on all vegans’ travel plans – Allston. 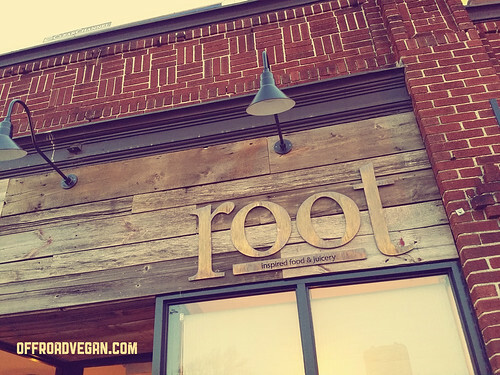 Similar to Portland’s vegan mini mall, there is a corner at a major intersection with a vegan chinese food restaurant, vegan ice cream shop, and the newest member – Root. Root occupies the space that used to feature Peace O’ Pie, one of my staple vegan establishments in Boston. But they occupy it well, offering something new to the scene. The branding and space design is beautiful and a respite from the urban environment of Allston. 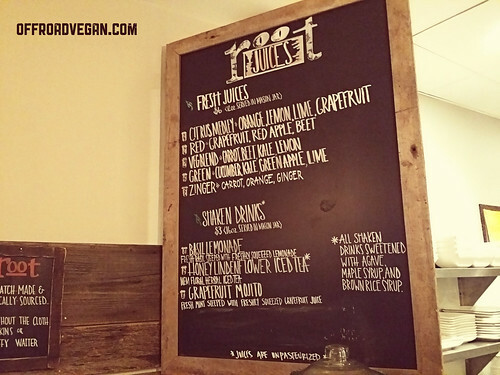 The menu, while relatively limited to six “big bites” options, is diverse and a great reflection of the spirit of Root. 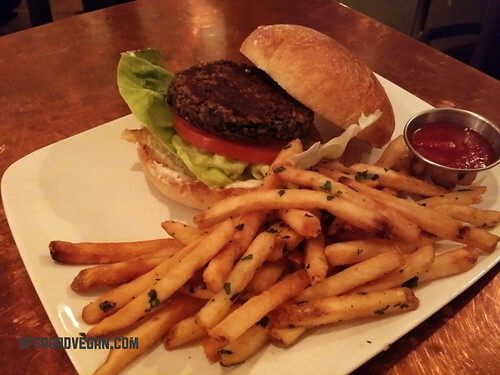 I opted for the Root Burger, a housemade vegan patty with garlic aioli and the standard burger veggies. The burger was actually outstanding – GREAT flavor with a soft fresh bun and housemade ketchup (I think it was at least) was a great touch. And the fries? AMAZING. The two ladies at the table next to me told me about their Eggplant Caprese sandwiches which looked amazing. While I am not a huge eggplant fan, I may give it a try on my next visit. The drink options: Fresh and good, but lacking options that match their menu. Drinks are an interesting offering of fresh blended juices which is a healthy option, but at $6, steep and hard to pair with many of their options. I went with the “Citrus Refresher” and while a very good juice on it’s own, it did not pair well with my burger. I get the healthy angle, but some all natural sodas would be a great addition. A bright, warm, and inviting space. The space was very well designed for being so small. They do not have public wi-fi which was surprising, and no bathroom. The staff was very pleasant and eager to help. Root is a great addition and provides a healthier option in the “Allston strip.” I will definitely be back!